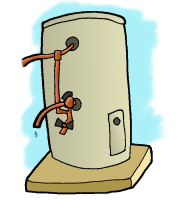 If you have a storage based hot water service, either installed inside or outside, you'll find it has a relief valve on the side that vents water as the service heats up and the water inside expands. On an outside hot water service, it should be pretty easy to find the valve - usually it will be a piece of unterminated copper pipe, probably leading onto some damp concrete or a patch of weeds and moss. For an internal hot water service, either the valve will vent outside through a wall, or it will go down a drain inside. If it goes down a drain, this tip won't apply to you. You won't notice how much water your hot water service is venting if it is just dripping onto bare ground, as the water will either evaporate or soak away. But try putting a bucket or watering can under the vent (its a good idea to put something heavy like half a brick in the bottom of the bucket so it doesn't blow away when it is empty) to catch the water and you'll find an average sized hot water service will produce around half a bucket of perfectly good water per day. Catch this water in a container and pour it on your garden instead of letting it go to waste. Tip: don't put a hose onto the vent to direct it to the garden, and don't put a pot directly under the vent - the water is very hot when it first comes out, and hot water is very effective at killing plants.